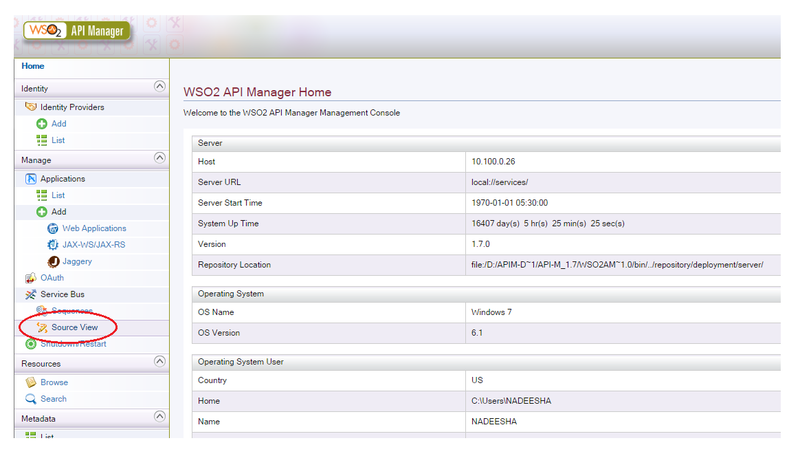 WSO2 API Manager provides an intuitive UI that can be used to add and configure API’s that are exposed via the API Manager. However not all the capabilities of an API can be manipulated from the API Publisher’s UI. Certain tweaks require the access to the API definitions directly. There are two possible ways of doing this. Access the Management console of the API Manager from the following URL and log-in using the admin credentials. Once inside the management console, you can see the source view icon on the left hand side navigation bar as indicated below. Navigate to the source view page. Here you would find all the API definitions, you can change the API definitions as required. 2. Directly accessing the API definition from the file system of the API Gateway. API definition is stored in the file-system of the API Gateway, you can access this from the following folder path. Each API is represented by a xml file. You can change the definition by changing the contents of the file. The changes would be hot deployed to the API Gateway. Please be mindful of the changes you make as it affect the exposed API’s. API’s are defined in Apache Synapse hence you would need some level of knowledge on Apache Synapse to manipulate these files.